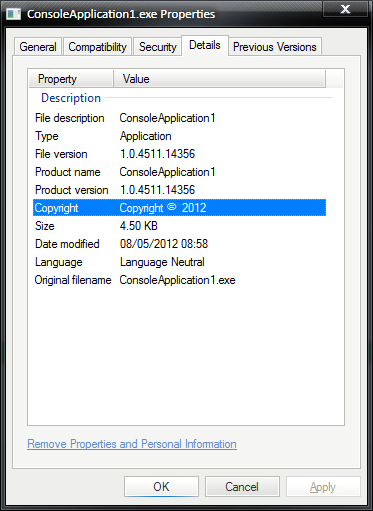 Ever since the release of .NET 1.1, there has existed an AssemblyVersionAttribute. This attribute determines the version number boiled into all .NET assemblies that is (supposed to) indicate something about when the assembly was built. Whenever you create a new C# project in Visual Studio, it helpfully creates an “AssemblyInfo.cs” file (found in the project’s ‘Properties’ subfolder), that the new developer generally ignores (to their cost). This file is mostly auto-generated and manipulated from the project’s property pane. Unfortunately, the usefulness of the property pane means too many developers never get round to looking at this bit of code, or the helpful comments, which is why Visual Studio hides it away in the “Properties” subfolder in the first place. The first thing to note is the funny syntax [assembly: AssemblyVersion("1.0.0.0")] . Actually, if you take a look at the MSDN attributes documentation, you will see that this is the full syntax for declaring an attribute – the bit before the : is actually the attribute target being set explicitly rather than being implied. This is particularly useful for assembly attributes – where there’s no code element to stick them next to. Actually, from the same documentation, you’ll notice some of the other elements that can be targeted with an attribute – but that’s another story that I might come back to in a later post. So these are just normal attributes, targeted at an assembly itself. And there’s quite a few of them. 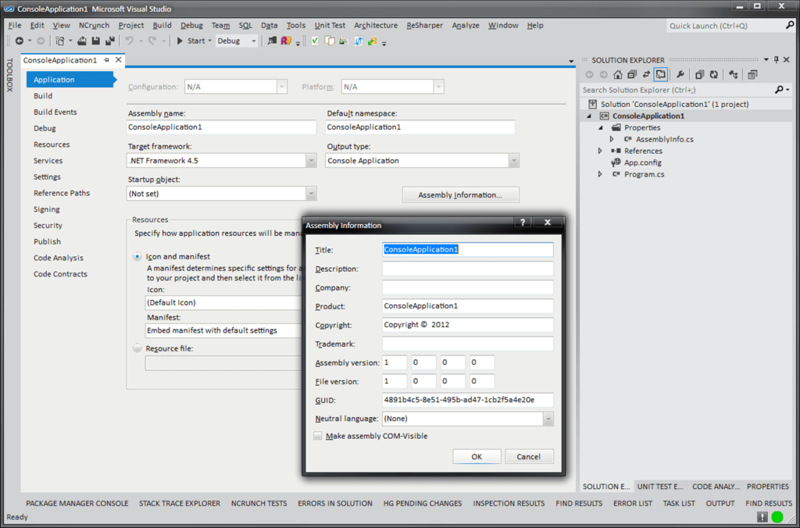 As you can see from the above screenshot, it’s possible to edit them all using the “Assembly Information…” link on the first pane of the project’s properties panel. However, if you take the time to read the helpful comments in the source you can find some really useful information, and (importantly) you learn about the “1.0. *” assembly version trick. If you drop the AssemblyFileVersion attribute then the file version is set to being, the same as the assembly version (which is what you want in the majority of cases). At this point, if you’re getting confused by AssemblyVersion in the code, but AssemblyVersionAttribute in the documentation, then don’t worry you can use either as the attribute name, but by convention (and for convenience) C# lets you drop the “Attribute” suffix from the attribute class name. Now it’s set to “1.0.4511.14356”. So clearly, this is a different version of the application. It’s probably worth pausing and pointing to the other useful information in the properties window, which also comes from the assembly attributes. If nothing else you now know why it’s worth spending the time setting all those values! (Though in the example above they’re all defaulted). The second build was 5 minutes later. In the example above, you can see the debug and release assemblies were built at different times. The other buttons allow useful stuff like auto-generation (to show the current date & time in version format) and copy to clipboard. This tool is ‘commentware’ that is use it as much as you want but please leave me a comment !